This technique reminds me of working on large-scale murals in college. 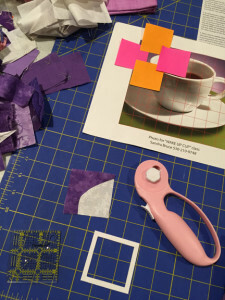 Now, I find it helpful in piecing gentle curves in bite-sized pieces. When she states that this process “involves piecing in a loose, representational style inspired by the painter, Chuck Close,” I feel like I’ve truly come full circle. I’m still working on my little Cup o’Tea. Cheers! This entry was posted in Quilty Projects and tagged art, gridwork, material matrix, purple by mkreative. Bookmark the permalink.